Looking west in the 1860s from approximately 16th and Alabama Streets, Mt. Olympus and Buena Vista Park peak visible in both pictures. 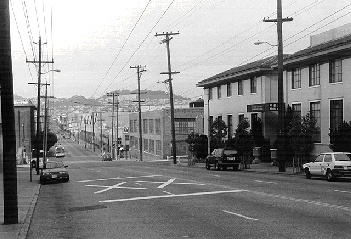 Looking west from 16th and Alabama in 1994; Mt. Olympus is the bump on the skyline, left-center. The Mission takes its name from the first European settlement in what is now the city, one of thirteen Franciscan missions established under Fr. Junipero Serra. The original Mission is intact (with a mural painted close to its founding recently discovered), adjacent to its old cemetery on Dolores Street just off 16th Street. Dolores Street is part of the old El Camino Real (still the name for the major suburban six-lane strip running through the peninsula's towns) and there are one or two of the old curving bells which were placed along the original route in the early 1900s as a promotional campaign. The Mission was established in 1776 near the shores of the original tidal inlet that was fed by Mission Creek, that still runs underground in culverts on 18th from its source on the eastern slopes of Twin Peaks near Corbett and Clayton. The Mexican land grants to the De Haro family and the Bernal family divided the territory between today's Potrero Hill and Bernal Heights. Neither family prevailed in decades-long legal procedures from the 1850s-80s trying to retain their property rights against thousands of squatters. 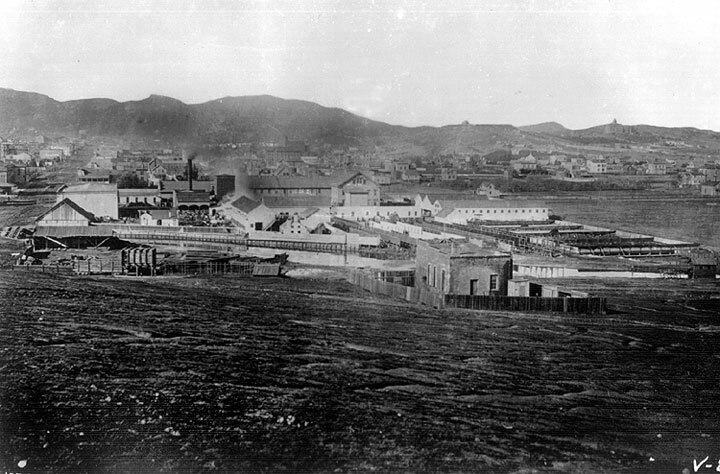 In its earliest days, the Mission District was a mixed neighborhood of Eastern European, Irish, Swedish, and German immigrants. The neighborhood transformed, however, after the 1906 earthquake and fire. The Mission District was one of the few neighborhoods in the city that was not burned to the ground in the devastating fires that ravaged the city after the quake. Residents of burned-out areas, especially the South of Market area, moved to the Mission and pushed out the middle class families that had occupied the neighborhood, making it into a low-income working class neighborhood and the most heavily Irish area of San Francisco. This migration of Irish families extended to Noe Valley, Eureka Valley, Potrero Hill, Bernal Heights and Glen Park. Many Italian immigrants also moved into the Mission after 1906. In the late 1950s, the Latino community that had been centered on the Guadalupe Church in North Beach began moving over to the Mission, making St. Peter's church on lower 24th Street a majority Spanish-speaking parish by the late 1960s. Fed by waves of immigrants, some fleeing from the Central American civil wars that burned hot during the 1970s-80s, the neighborhood took on its Latino identity more fully. But after the gentrification that began in the mid-1990s, property values have soared along with evictions and displacements, the Mission is in transition again. New multimillion dollar condominiums have replaced gas stations and auto repair shops. Punk rockers and the lesbian community that moved in during the late 1970s and early 1980s have given way to a plethora of upscale restaurants and bars, clothing boutiques, and galleries. The neighborhood is home to extreme wealth and poverty, and still provides the culturally rich and dynamic energy that has attracted so many. But there is a foreboding sense that what has made the Mission special is being lost as the years go by. Forget Affordability: In Defense of Cheap Rent! Green Glen Linen: End of an Era Live/Work Luxury Condos A Coming!